Ptl. Marino visited one of Pine Hill’s Pokemon Gyms to make sure everyone was battling nicely! We encourage you to enjoy the new world, but do it safely and be aware of your surroundings! • Tell your kids about stranger-danger. 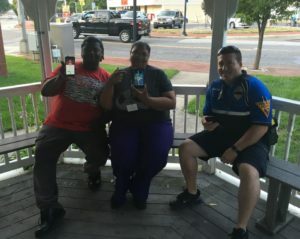 The way that the game is designed can bring people together in the real world as they search for Pokemon in common areas called gyms and pokestops. Obviously, you never know who you could run into while playing. • Setting the limits on where your kids can go can limit the amount of strangers that you or your kids could encounter. • Watch the road! We have seen a number of people – both kids and adults – so engrossed while staring at their phones and following a map, that they’ve walked right into the street and into objects. Pay attention! • And as always, if you run into an individual that is seemingly up to no good – don’t hesitate, call dial 911!